The Corporate Giving Webinar Series can help you think smarter and perform better when it comes to combining corporate mission with philanthropic action. By joining, you'll hear data supporting the need for corporate philanthropy and development strategies to help giving programs succeed. This series is designed for staff and trustees working with corporate foundations or giving programs, but all funders are welcome to attend. 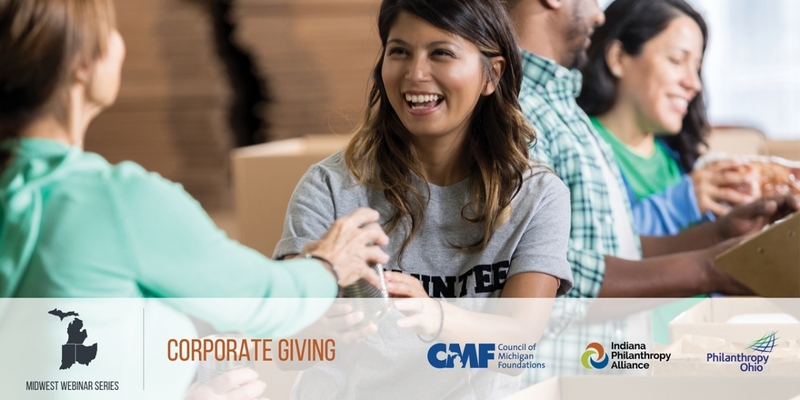 This Corporate Giving Webinar Series is presented in collaboration with IPA, Philanthropy Ohio (POH), and Council of Michigan Foundations (CMF). Together, we hope to harness and share the collective expertise of each state’s leading philanthropic organizations and trusted community partners. IPA Members (FREE): To register yourself and/or a colleague at your organization, please log in, select a program above, and click the Register Now button. Members of Philanthropy Ohio and Council of Michigan Foundations: Members of CMF and POH are encouraged to register through their association’s website. All Other Funders ($50 per webinar): Those who do not already have an online account to IPA's website, may register through the Council of Michigan Foundation’s (CMF) website here. If you have not already set up an account with CMF, you may do so here prior to purchasing the webinars.